New technologies and social media in the last two decades have fundamentally changed the way consumers think, behave and engage with brands. While traditional marketing models are still applicable, marketers today are learning a whole new set of digital marketing skills and strategies to better connect with consumers. It’s no surprise then that digital marketing spending is forecasted to account for at least 35% of total marketing budget this year, and is predicted to grow another 12% next year. This increase in digital marketing investment has created a surge in demand for digital marketers. These digital marketers are marketing nerds who are obsessed with analytics and big data, but are also highly creative and skilled in everything from copy writing to graphic design, photography and videography. If you are a digital marketer or aspire to become one, what are some of the top digital marketing trends or ideas you’ll need to know this year? Onalytica asked seven of the influencers identified in their Top 100 Influencers And Brands research to share their views, check out what they have to say! In full disclosure, I was identified as one of the influencers and was asked to share my opinion on the topic. You can find last year’s list here and 2014 list here. Here are the top 50 individuals Onalytica identified as the most influential in the digital marketing landscape. Be sure to click on the download button below to see the complete list. Onalytica was interested in seeing which topics were most popular among their identified top influencers, so they analyzed their tweets and blogs from January 1st to April 19th this year, counting the number of mentions each marketing topic received. 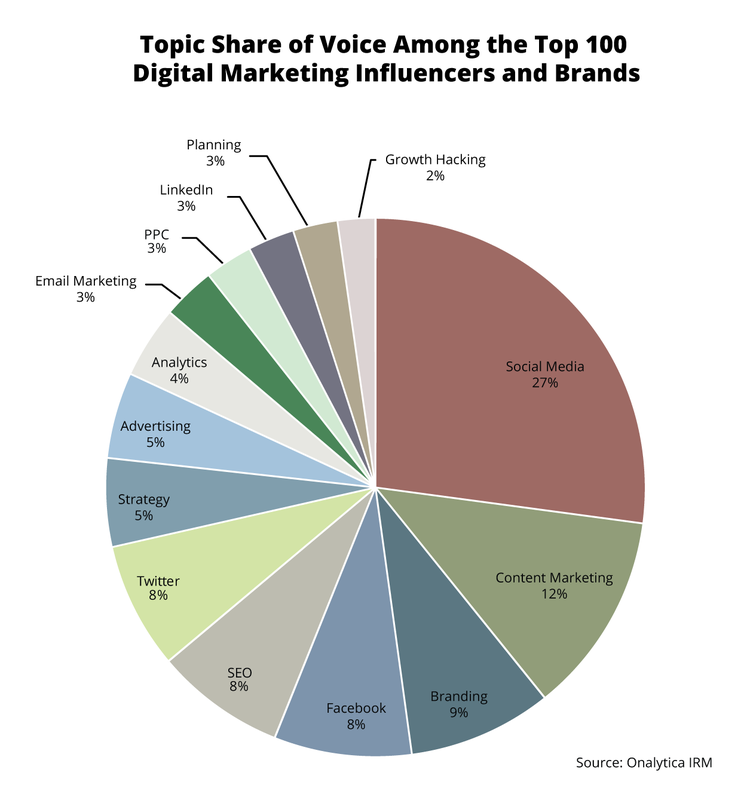 Social Media dominated the list with 27% share of voice, with Content Marketing coming in at second with 12% and Branding at 9%. Facebook, Twitter and SEO were tied for fourth place at 8%, followed by Strategy and Advertising both at 5% and Analytics at 4%. Email Marketing, PPC, LinkedIn and Planning all received 3%, with Growth Hacking rounding out the list at 2%. Onalytica also looked at which marketers and brands were leading the conversation on Twitter, so they analyzed over 1.5 million tweets from December 4th, 2015 to April 29th, 2016, mentioning the keyword “digital marketing,” and identified the top 100 most influential individuals and brands who were leading the online discussion. Onalytica discovered that there was a very engaged community of high profile marketers, business professionals and brands. 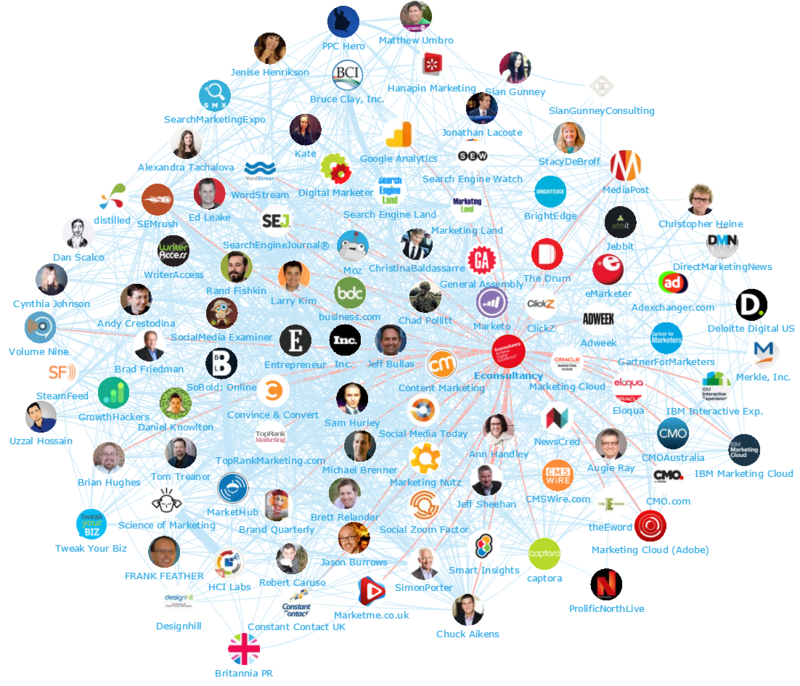 Below you can see the network map of the online conversation Onalytica created with their Influencer Relationship Management software (IRM), showing the #1 Influencer Jeff Bullas at the center and the conversations to and from the influencers in his field. 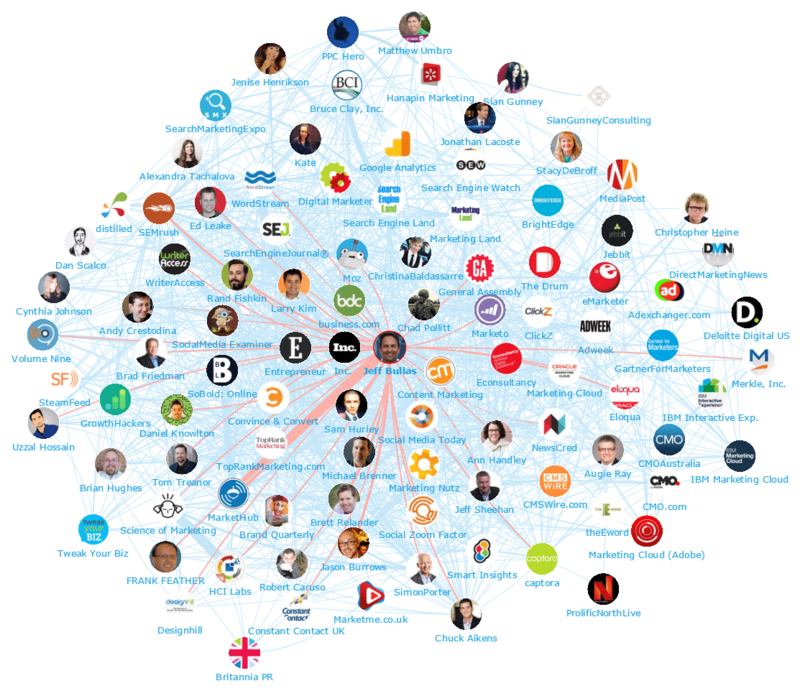 Here’s another network map with the #1 Brand Econsultancy at the center, and the conversations to and from the influencers in its field. Do you have any tips on how to become more influential in one’s niche? Please share your tips below! How does Joe Pulizzi or Robert Rosen not show up on this list? I see the CMI logo but individually, is there anyone in the country more influential than Joe in the content marketing space? Hey Gary, I agree with you as both are great friends. I think this list focused on “digital marketing” specifically and as with any technology, it doesn’t know that content marketing is such an important component of digital.